Travelucion is the world leader in Free Online Travel Guides. We offer 130+ countries and over 800 websites, all for free! 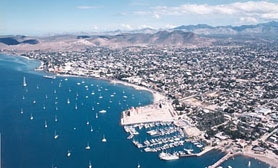 You´ve visited Baja California Sur Mexico, why not visit our other Free Mexico Guides or Visit our other world travel guides? If you´d like to help us grow our destinations with vital information, we´d be glad to include your commentary and feedback on any destination we offer. If you´d like to propose to Travelucion your royalty free images with editorials written by you, each section created will feature your name (if you wish) and a link back to your website. Contact us using the form below to receive instructions on how the information should be sent. We also welcome comments, reviews or updates of our information which can be written below the relevant articles directly.